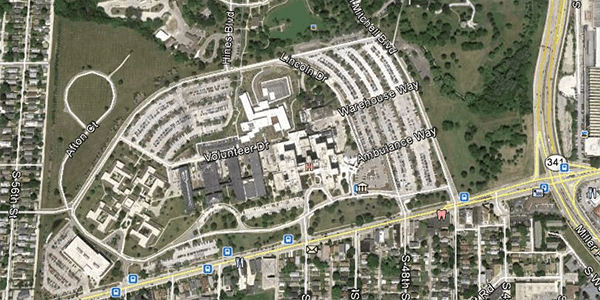 Milwaukee Veterans Administration (VA) Medical Campus Traffic and Parking Study - TADI - Traffic Analysis & Design, INC. Milwaukee Veterans Administration (VA) Medical Campus Traffic and Parking Study - TADI - Traffic Analysis & Design, INC.
TADI’s knowledge of the adjacent I-94 reconstruction project proved vital in the analysis of the internal VA Campus intersections. TADI worked with the Veteran Affair (VA) Administration in their planning to construct a new parking lot and several parking structures to alleviate a strained parking demand within their campus located along the north side of National Avenue between General Mitchel Boulevard and 56th Street in Milwaukee. As part of the planned construction, the VA had requested a traffic and parking analysis be conducted to determine the additional traffic expected to be generated by the new parking facilities and to identify roadway improvements necessary to accommodate the planned facilities as well as future buildout plans for the Medical Complex. The traffic study component included relocation of parking lot access driveways, extension of queueing areas for entering and exiting traffic, gate placement and recommended traffic control at some of the internal campus intersections. The parking study component included internal circulation analysis, arrival and discharge patterns analysis, and recommendations of an improved pick-up/drop-off area while addressing parking demand and supply for the phased master plan. TADI’s knowledge of the adjacent I-94 reconstruction project proved vital in the analysis of the internal intersections as traffic patterns within the VA campus are expected to be impacted as part of the I-94 project. All work was completed on a tight schedule.